The wind howls through the mountain pass. Dark clouds roll across the sky. The Man looks up as He takes hold of the long gnarled branch He’s using as a walking stick. He grips it more tightly. The path is narrow and treacherous. Walking carefully across the rocky path He stops for just a moment and glances up. He sees an eagle off in the distance. His majestic wings spread wide and as though floating on the currents, the eagle glides with the wind. The Man walks a little further and stops again when He hears the screech of a hawk. He smiles as He watches the bird flutter to a stop at the top of a tree. Rain begins to suddenly pour from the sky and He lifts His face allowing the large drops to pelt His bearded face. His hair is soon soaked, His beard drips, and squinting His eyes closed He sticks His tongue out to catch the drops of rain. “Oh Father, what a beautiful and glorious sight,” He whispers. Rain pelts His head, His shoulders, and His back. Soon He is dripping wet. 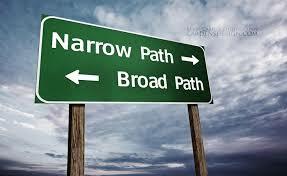 It doesn’t bother Him as He continues to follow the narrow path. The stranger hesitates and snarls, “What’s the difference, water is water?” He suddenly snatches the canteen from the Man’s hand and gulps thirstily. “I am the Living Water.” The Man replies. “Whoever drinks of My water will never thirst.” The man hands the now empty canteen back to the Man; grunts, swipes a hand across his mouth and beard and stands. “Thanks for the water,” he states gruffly as he tugs at his pants waist, stretches, and without another word walks on down the narrow path. The Man watches as the stranger approaches a Y in the path. He stops and looks to the narrow path, then the wider path. He runs his hand through his long wet hair as though trying to decide which path to take. He glances back at the Man watching him. “Father, help him to choose the right path.” The Man whispers. Continuing to watch the stranger, the Man lowers His head, blinks back tears, as the other man steps onto the wide path and walks away. God is not a dictator as some seem to think He is. He has given each one of us free will. We are free to choose the path that we will follow through this journey called life. In life there are many paths that we have walked. If the path is narrow and treacherous we naturally tend to avoid it and take the wider paved road because it is so much easier to traverse. But the Lord says it is that wider path that leads to destruction. Why? Following Christ in our walk with Him is not always easy. He leads us in ways of righteousness where the enemy of God, the devil, leads us to hell. It is easy to do what we want to do and more difficult to be obedient to that which the Lord calls us to do; love our neighbors as ourselves, don’t gossip, give of ourselves to others, love your wife as Christ loves the church, obey your parents, and the list goes on. The reward to following the narrow path leads us to forgiveness and His assurance of an eternal home with our Lord and Savior.